The Home Office does not remove people for failing to buy insurance, but will not issue them with the guarantee of permanent residence. As EU migrants can use the NHS, many did not realise they needed health insurance. Students and full-time parents are among those affected. They are worried they could be vulnerable after Britain leaves the EU. Tim Strahlendorf moved to the UK from Germany when he was 13. He said he had been refused a residency document because he had spent time studying in the UK without paying for health insurance. He said: "It never would have occurred to me that anything like this could have happened." 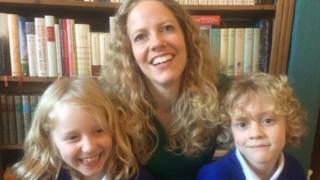 Nina Hofmann, a married language tutor who moved from Germany to the UK in 2006, said her solicitor told her not to apply for residency because she would be refused. She took time out of work to care for her children - Benjamin, 6, and Sophia, 8 - and had not bought health insurance. She told Today: "It is this fear I could be asked to leave in the end sooner or later. "Maybe not with a knock on the door but with a letter because I've fallen through the cracks." Another failed applicant for a permanent residence document was told by the Home Office she should make arrangements to leave. The government has since re-worded the letter, and failed applicants are not removed from the country, but many are worried they could be vulnerable after Britain leaves the EU. Liberal Democrat, Labour and crossbench peers want to amend the bill to include a fast track procedure to give EU migrants a reassurance they can live in the UK. The rule change would give people from the European Union, European Economic Area (EEA) and Switzerland the right to live permanently in the UK, without having to prove they bought insurance. The amendment has been tabled by Liberal Democrat Lord Oates, Labour's Lady Kennedy and crossbench peer Lord Cromwell. It is one of many amendments tabled, but its backers will hope for a concession from ministers as the Lords consider the Article 50 bill. A Home Office spokesman said EU citizens made a vital contribution and securing their status - and those of British nationals elsewhere in the EU - was a priority. He said: "The rights of EU nationals living in the UK remain unchanged while we are a member of the European Union. "For self-sufficient people or students and their relevant family members, it's always been the case that exercising Treaty rights includes a requirement to have comprehensive sickness insurance and sufficient resources to not become a burden on the social assistance system of the United Kingdom." According to the Migration Observatory at Oxford University, a quarter of applications for permanent residence documents were refused in 2015. Almost 15,000 EEA nationals received permanent residence documentation in the third quarter of 2016, after the referendum.